At 73 years old, you can still count on Mac “Dr. John” Rebbanack to zig instead of zag, to shift gears in mid-turn. So it’s really no surprise to find him following up his stellar Dan Auerbach-produced 2012 album, Locked Down, a record that found him somewhat reinventing himself for a new generation, with a batch of songs firmly entrenched in a previous generation. But he’s determined to brings those songs up to date too. Ske Dat De Dat: The Spirit of Satch is a tribute to the music of Louis Armstrong and the songs that became associated with him in his illustrious and influential career. Dr. John is no stranger to such compendiums. In 1999, he released the tribute to Duke Ellington, Duke Elegant. In 2006, he covered the songs of Tin Pan Alley songwriter Johnny Mercer on Mercenary. And he’s always had a penchant for covering songs of all genres and mixing them into his own distinctive musical gumbo. So it’s also no surprise that he drags these old tunes—Dixieland songs, pop standards and big band jazz numbers—through the sounds of the intervening decades, sometimes in the same song. He infuses “Mack The Knife” with devastating ‘70s funk grooves, top-notch playing by trumpeter Terence Blanchard and a rap by Mike Ladd that deftly touches on the song’s German origins in a Berlin production of Threepenny Opera. Talk about covering all your bases. In fact, there are guests throughout the record. Often, these star-studded tribute affairs can come across as gimmicky and uneven. Here the guests serve to shed new light on the soul of the songs and to illustrate the breadth of influence Armstrong’s music has had. Dr. John alternates between gospel-styled reimaginings, deeply funky dance grooves and bluesy duets, throwing in the occasional curveball. “Tight Like This” is rendered an Afro-Cuban foray, utilizing Cuban trumpeter Arturo Sandoval and Cuban rapper Telmary to provide the Latin flair. Dr. John employs a bevy of New Orleans trumpeters elsewhere—James Andrews, Nicholas Payton, Terrence Blanchard and Wendell Brunious—to honor the spirit of Satchmo’s playing. But he also brings in guests from the worlds of R&B and gospel music—all a testament to the legacy that Armstrong left and the many branches that sprouted from his inspiration. The Blind Boys of Alabama add gravitas to gospel renditions of “What A Wonderful World” and “Wrap Your Troubles In Dreams.” The McCrary Sisters do the same for “Nobody Knows The Trouble I’ve Seen” and “That’s My Home.” R&B crooner Anthony Hamilton takes on vocal duties for “Sometimes I Feel Like A Motherless Child.” Duets with Bonnie Raitt and a sassy Shemekia Copeland reveal the blues in these tunes. It might have been easy to just sign up a bunch of good trumpet players and have them play faithful renditions of Armstrong’s hits. 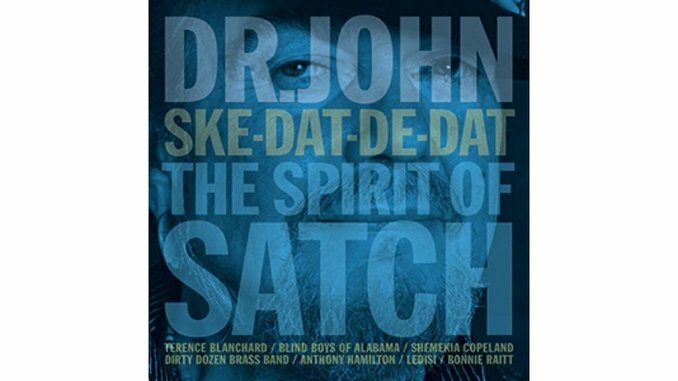 Instead, Dr. John shows us the scope of Satchmo’s influence, how the early American music that he pioneered has blossomed into a multi-faceted music that still has his soul at its center. And for pulling off that trick, Dr. John proves that he’s still the king of the hoodoo himself.